Our Stud Conversion Kits for your classic M3 are a direct replacement for the factory BMW lug bolts; made with great pride and expertise in Philadelphia USA. Many sanctioning bodys and track day events require your BMW to use wheel studs, plus; it’s much easier to mount and dismount your wheels with studs rather than the cumbersome bolts. Kit Notes: This is for a E30 M3 ALREADY Converted to a 5-Lug solution, this is NOT a 4-Lug to 5-Lug conversion kit. 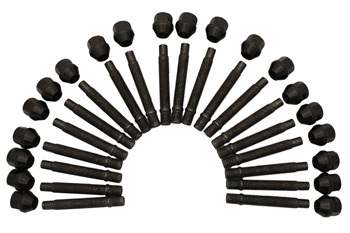 This replaces your factory Lug Bolts, with Wheel Studs and Lug Nuts.